Laura Beers, associate professor of history, has won the Stansky Book Prize for her book, Red Ellen: The Life of Ellen Wilkinson, Socialist, Feminist, Internationalist (Harvard University Press, 2016). The Stansky Prize is awarded annually by the North American Conference on British Studies (NACBS) for the best book published anywhere by a North American scholar on any aspect of British studies since 1800. 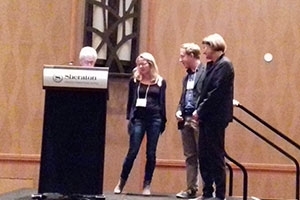 This year’s award was announced at the annual NACBS meeting in Denver, Colorado, earlier this month. Red Ellen chronicles the life of Ellen Wilkinson, who helped establish Britain’s Communist Party, earned a seat in Parliament, and became a renowned advocate for the poor and dispossessed at home and abroad. She was one of the first female delegates to the United Nations, and she played a central role in Britain’s postwar Labour government. In all, Red Ellen was the product of eight years of work, which Beers started before she joined AU in 2009. “I’ve had several fellowships that took me away from Washington, and which enabled Ellen’s completion, but much of it was written at American University, which provided key financial and intellectual support for the project,” she explains.